Learn everything you need to know about your 40 week old baby. Track important developments and milestones such as talking, walking, growth, memory & more. 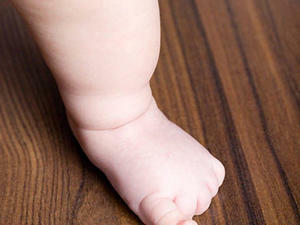 At 10 months old your baby might be able to stand on his own for a short time. If he's comfortable cruising, he might add a new twist to his physical repertoire by bending down and picking up a toy from the floor while holding onto the couch or table. And if you hold onto his hands, he might take a few shaky steps forward! So offer him lots of chances to practice. When will Baby start actually walking? For early steppers, it could be anytime, but as with most milestones, there's a huge range in what experts consider "normal." It's not uncommon for kids to hold off on walking until 15 months, or even 18 months in some cases! At the same time, your baby's language development continues at a quick pace. He might respond when you ask him to do something, such as wave bye-bye or pick up his sippy cup. He might say a few actual words, such as "Mama" or "Dada," or imitate animal sounds, by barking like a dog, for instance. You might notice that he shakes his head when he hears the word "No," or puts his finger over his mouth when you say "Shh." Cutest of all, he uses exclamations, such as saying "Uh-oh!" when the juice spills or he drops his toy keys. He learned all of these lessons from watching you! Help those communication skills along by encouraging your baby to verbalize what he's trying to tell you. When he reaches for his stuffed animal, for example, say, "Oh, do you want your bear?" Doing so will help build his vocab over time. As your baby gets older, it's natural for the amount of sleep he needs to decrease little by little. At 10 months, your child might sleep a bit less at night -- refusing to go to bed till later, waking up at the crack of dawn, or both -- and he might be cutting out his third daytime nap. But even though your baby might not want to snooze as much, he'll still get pooped from time to time. With all the activity he's doing, such as cruising, crawling, or walking, he burns up a lot of energy, and he shows his tiredness by getting cranky and moody. Like he did when he was overtired at a younger age, he'll scream or arch his back when you try to feed him, rub his eyes, or pull away when you go in for a hug. Fatigue can even make your baby less coordinated, so if he's stumbling or falling more during his cruising episodes, it could be your cue to put him down for a nap. It's also common for kids this age to wake up in the middle of the night to practice pulling up or cruising around their cribs. Just quietly lay Baby back down, pat his back, and encourage him to go back to sleep. When these physical abilities aren't so new and exciting, his sleep patterns will settle down. Until then, aim for 11-14 hours of total sleep each day for the next several months. If he's especially restless at night or skipping naps, try bumping up his bedtime in 15-minute increments until he seems to be better rested. If you're not naturally a "glass half full" kind of person, the late stages of babyhood will give you plenty to complain about. Suddenly, your baby is off and running -- and that means more messes to clean up, more anxieties about injuries, and far less time to catch your breath. As your baby learns to maneuver himself around the house, he'll also come across many more opportunities to get into trouble, and hearing you say "No" might just provoke giggles. It's enough to make any mom cry. That's why it's so important to focus on the positive things about your baby right now -- like the fact that he's meeting milestones, getting where he wants to go, developing his own personality and preferences, and expressing himself with far more clarity. The frustrations will always be there, and some will grow right alongside your baby. (Even teens aren't exactly known for being neat and tidy.) But learning to appreciate the good times will make motherhood feel less like a struggle and more like a grand adventure. If you're dealing with feelings of frustration, keep a gratitude journal and record one or two things a day about which you can be happy, such as the Texas-size grin on your baby's face when he pulled up for the first time, or the fact that you can finally share your favorite fettuccine Alfredo recipe with your little one. Boost her language skills by telling her make believe stories.